I feel like the older I get, the more and more the holidays have been redefined. It used to be that the world stopped on major holidays like Thanksgiving and Christmas. Everyone had a couple days to just sit back and enjoy time with their families. However, times are changing. My family is moving to different parts of the country so it is getting harder and harder to get together. Businesses are staying open year round and people have to work. It seems like I am finding myself opening my home and table up to friends, as well as family, more often. And with everyone's schedules being all over the place I love keeping my holiday meals as simple as possible. That is why I am IN LOVE with this Sweet and Spicy Glazed Ham. 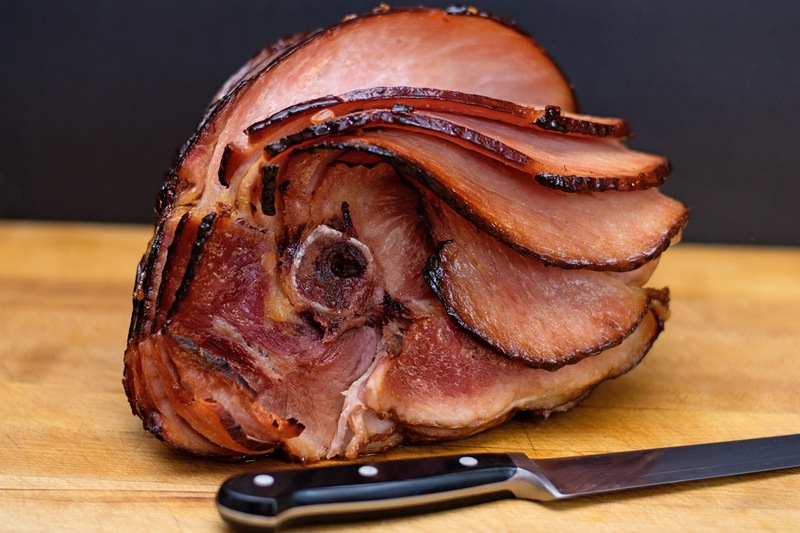 With only three simple ingredients you are going to have one of the most delicious holiday hams to grace your table. You aren't going to believe how easy it is and I can't wait to share it with you. To kick this holiday feast off, you are going to need a good base. That base is going to be a great ham. 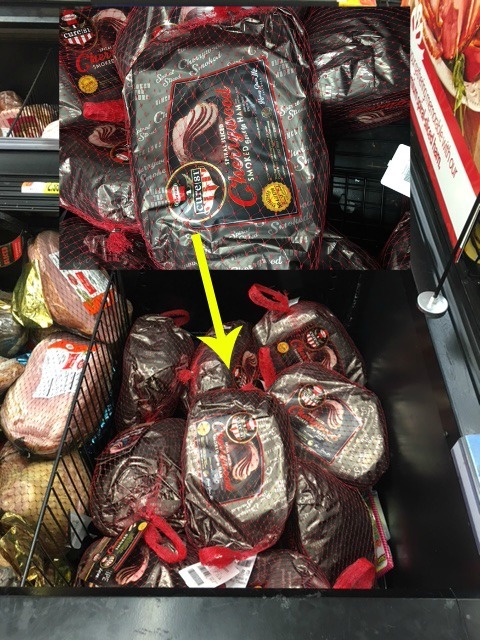 While shopping at Walmart I was really attracted to the beautiful packaging of the Hormel Cure 81 Cherrywood Smoked, bone in ham. The cherrywood is going to provide and wonderful flavor base for my glaze, and the fact that it is already sliced is just going to make everything easier. To begin preheat the oven to 350 degrees. Place the ham on a roasting rack, and into roasting pan. If you do not have a roasting rack OR pan, you can place the ham on a baking sheet with sheets of aluminum foil shaped into rods underneath it. Whoops! I forgot to get a picture with the foil on. Next cover with foil and place in the oven. This was an 8 lb. ham so I baked it for roughly 2 hours. 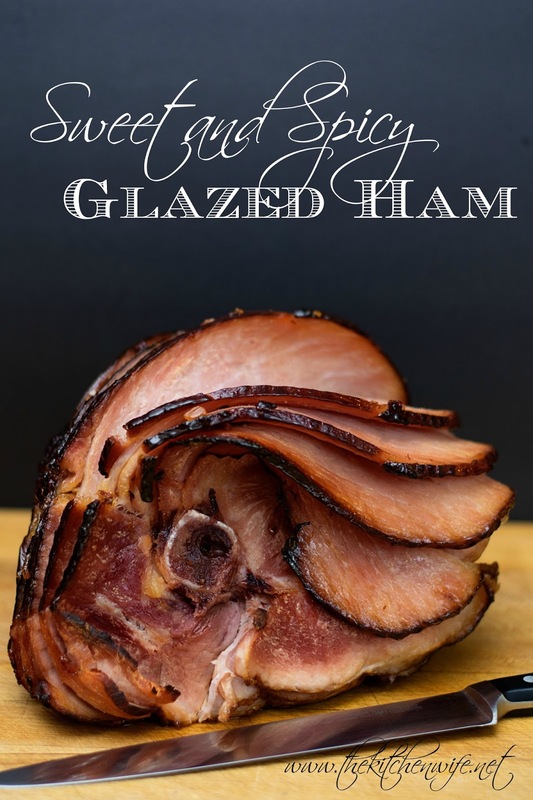 While the ham is baking you can begin this super simple glaze. Start by placing the orange marmalade into a sauce pan. Next pull two of the peppers from the can and finely mince them. You will add the minced chipotle peppers into the sauce pan with the marmalade along with a teaspoon of the adobo sauce. Add a pinch of salt to help balance out those flavors. Bring the glaze to a boil, then lower to a simmer. Cook for 10 minutes and then remove from the heat and set to the side. In the last 30 minutes of cook time remove the ham from the oven and take the foil off. Baste with the glaze, making sure to let is ooze down in between those slices. Place it back into the oven, uncovered, continue to cook for 30 more minutes. The sugars in the marmalade have caramelized and the ends of the ham have browned and crisped. Absolutely beautiful! The beauty of this ham during an "non-traditional" holiday dinner, is that it is delicious right out of the oven or at room temperature. And no matter who you are sharing this holiday with, this Sweet and Spicy Glazed Ham is the perfect centerpiece to any table, not to mention all of the great leftover recipes tomorrow! ;) And if you are looking for even more holiday recipes head on over to Hormel's recipe page and let me know which one is your favorite! Cook for 15 minutes per pound. At the final 30 minute marker on your ham, remove it from the oven, uncover, and brush the glaze all over it. Return the ham to oven, uncovered, and let cook for 30 minutes. In a sauce pan combine the orange marmalade, and minced chipotle peppers. Add a pinch of salt and bring to a boil. Once at a boil lower to a simmer and cook for 10 minutes.